Preheat oven to 400˚F. Peel the butternut squash and pears. 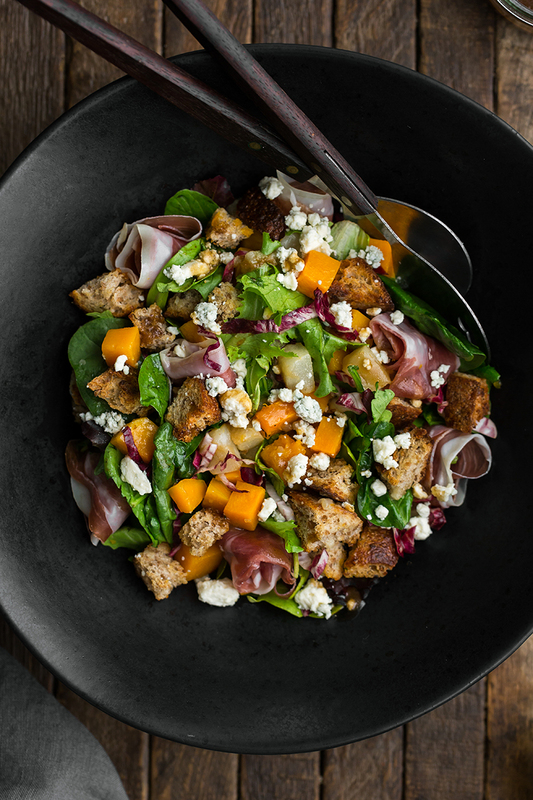 Remove the seeds from the squash and cut the pear and squash into ¼” cubes. Place on a sheet tray covered with parchment paper. Drizzle with olive oil, sprinkle with salt, and toss until well combined. Roast until the squash is tender and lightly browning, 30 to 35 minutes. Remove and let cool. While the squash is roasting, toss the cubed bread with olive oil, thyme, and salt. Place in the oven with the squash and toast until the bread has crisped and browned, 15 to 20 minutes. Remove from oven and let cool. 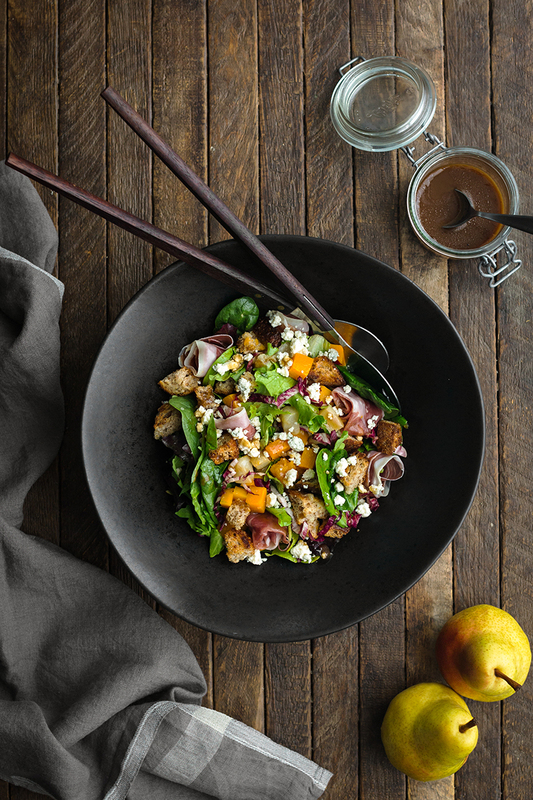 Combine the lettuce, chopped endives, roasted pear mixture, croutons, and blue cheese in a large bowl. Place ingredients for the dressing in a jar with a tight lid and shake well. 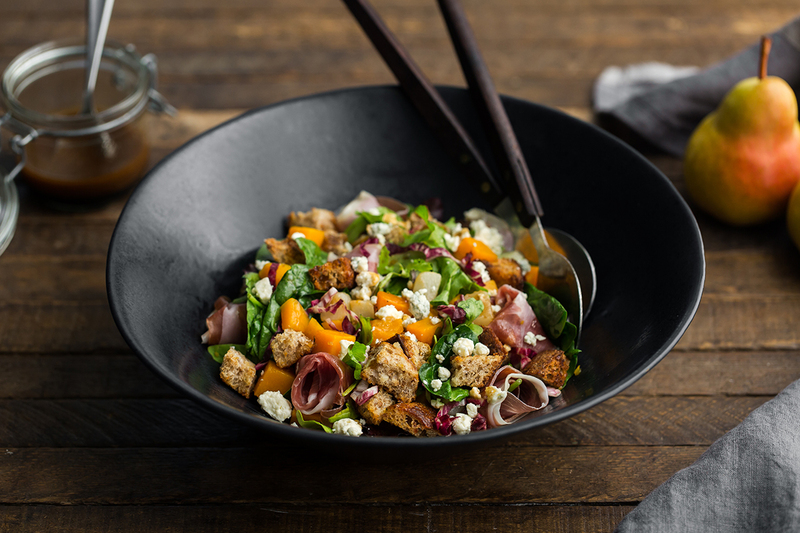 Drizzle over the salad and toss until the salad is coated with the dressing. Add the prosciutto and fold into the salad. If desired, the radicchio can be left out or substituted with shaved endives.